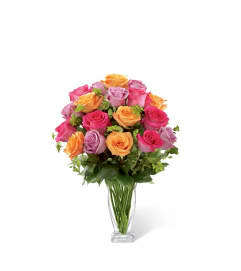 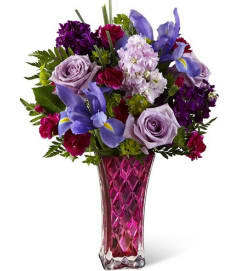 The FTD® Radiant™ Bouquet makes an inspired use of harmonizing and contrasting hues. 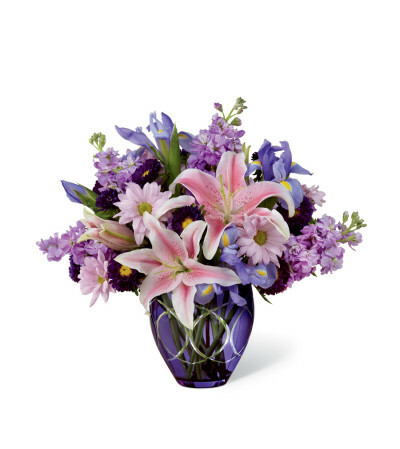 Soft pink Oriental Lilies, ruffled columns of lavender gilly flowers, deep blue irises, lavender daisies, purple matsumoto asters and lush greens create a simply stunning arrangement in a deep purple glass vase encircled all around with sparkling, brilliant cuts. This elegant bouquet can give a special lift to birthdays and anniversaries, or to send your "thank you," "get well," and "congratulations."